Galanos, paisley pattern, empire waist chiffon gown, embellished with beads and sequins, having a slim body with spaghetti straps. 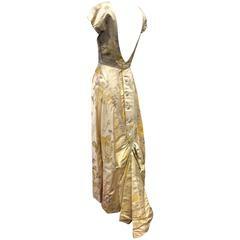 The outer layer of the dress has a paisley pattern in a silk chiffon. 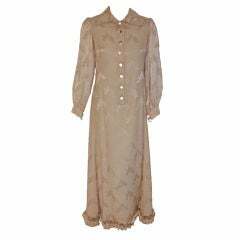 The underpinning is a silk charmeuse in the same paisley pattern. Galanos, black, wool crepe, halter neck cocktail dress having thick braiding detail along the neckline. Back is open. Simple sightly A line silhouette. 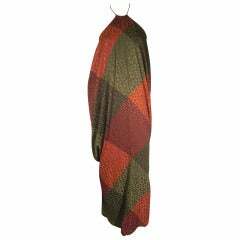 A gorgeous 1970s James Galanos halter gown in plaid silk jacquard. 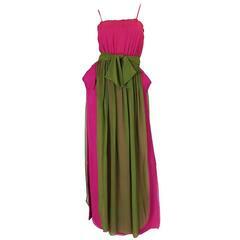 Dress has a knee length fitted lining inside that the gown glides over. Beautiful draping on this piece.